As a lady who loves makeup, fashion, and lots of other girly things, I like to think that I’m somewhat of an enigma when I walk around with my layered pixie cut and (faux) leather jacket. A year ago I never would have dreamed that I would have hair this short. Now I don’t know how my haircut could be any different! It made my fine, feathery tresses turn thick and shiny. I think it also reflects my optimistic, and somewhat oddball, personality. In honor of all the ladies with short hair…Here are 5 reasons why we are awesome! Anytime a girl goes and gets her hair chopped off, she’s seen as unique. 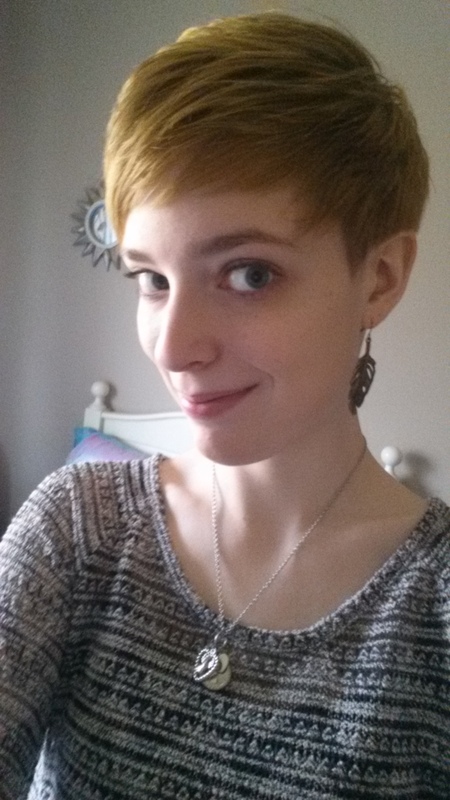 One of the most common complements I get is, “I wish I was as brave as you!” My pixie cut was actually a gradual process; only now I wish I would have known how awesome it would look so I could have donated it. If you’re like me, and do the whole every 6-8 week trims, then that gets rid of all your dull, dry, split ends. My hair is fine and kind of thin, but now it actually has body and is healthier than ever before (which is especially great if you like to dye your hair). Again, this might depend on your haircut–or your passion for letting out your inner stylist. I’m not so great with manipulating my hair, so I like the fact that now I can just blow dry and hairspray it in 5 minutes. Awesome for now, but I guess you can see how this might not be cool in the winter (yay scarves!). My hair’s definitely not perfect, and I still get bad hair days, but short hair is what God had planned for this gal. “But the very hairs of your head are all numbered” (Matthew 10:30 KJV). Hi there from the other end of the spectrum! I’m growing my hair out to knee (its about fingertip now) and I love long hair. Strangely, for some of the same reasons you like your short! I can throw it into a bun in literally 8 seconds, braid it in less than a minute, and since I’m no-poo I dont have to worry about any fancy shampoos! That’s awesome! I love long hair and tried growing mine out…only mine is thin, and it didn’t work out as well. Thank you for sharing and God bless! Are you going to the author fair in Grand Ledge next weekend? She reminds me of Winona Ryder! Love it…and I didn’t know about that art fair! I will have to check it out and see. Because I’m horrible at checking my email! Lol I’m terribly sorry about that. I will try to come to that fair.